BULAWAYO residents yesterday strongly rejected proposals in the Education Amendment Bill to allow pregnant pupils to continue with their studies as well as the abolishment of corporal punishment. 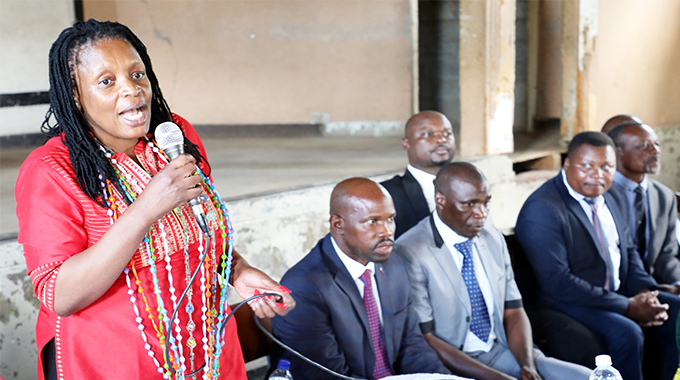 Residents and other stakeholders also demanded that the proposed law ensures that local teacher training colleges prioritise students from Matabeleland region to ensure that local schools have more Ndebele teachers. Contributors were in support of free education which is contained in the Bill. Speaking during public hearings on the Education Amendment Bill at Mabutweni Hall various stakeholders spoke with one voice on the issue of corporal punishment and the proposed inclusion of pregnant learners in schools. Ms Lina Mkoma from Mabutweni said pregnant learners must not be allowed in schools as their presence would affect other learners. “Pregnant girls should not be allowed in schools. Imagine in the initial stages of pregnancy when they are vomiting and all sorts of things, how that child will cope in class. They will definitely be a laughing stock from their peers and this might result in miscarriages,” said Ms Mkoma. A lady who identified herself as Ms Ndebele supported Ms Mkoma. She also said corporal punishment must not be abolished. “Corporal punishment is necessary because as it is we are struggling to deal with these youngsters. Imagine when they know that teachers cannot do anything to them, it will be chaotic. Teachers must be allowed to spank them but not use fists. It must be reasonable,” said Ms Ndebele. The issue of corporal punishment was the most dominant with contributors in agreement that teachers should be allowed to punish the students but the punishment must be ‘reasonable’. Another resident Mr Xolani Ndlovu said Government should provide free education. “From ECD to A level, education must be state funded. As it is, it’s parents who are constructing schools, they are forced to buy buses, construct perimeter walls and new blocks for ECDs which must be done by Government on top of the fees they would have paid,” he said. Mr Bhekisisa Ngwenya also echoed the same sentiment on free education. He added that more schools should be built in Matabeleland region as it is in other provinces. Mr Ngwenya said some children are forced to walk about 18 kilometres to school which he said would result in poor performance from the learners. Mrs Nokuthaba Ndlovu from Makokoba said teacher training colleges such as the United College of Education and Hillside Teachers’ College should prioritise enrolling students from Matabeleland. “We have a lot of teachers who are coming from other regions being enrolled at the colleges when our children here are being left out. This has resulted in non-Ndebele teachers dominating in our schools and this is killing our language, that issue must be resolved,” said Mrs Ndlovu. Other issues raised include that of inclusivity for disabled learners, learners being excluded from class due to non-payment of fees, teaching of sign language and lack of birth certificates for orphans. Most participants from Mabutweni and Iminyela who are elderly said their grandchildren were failing to continue with education as they do not have birth certificates and as guardians they were failing to get them. Cabinet approved the Education Amendment Bill in February and it was gazetted in the same month. The purpose of the Bill is to provide for the right to a basic State-funded education, including adult basic education, the right to equality and non-discrimination and the right to language and culture. The Bill is also expected to abolish corporal punishment. It also ensures that children that are also within a particular zone are not disadvantaged by those that come from other areas as they must be given priority. It will also deal with the area of teaching of local languages and address the issue of teaching of children with disabilities including facilities to be availed to them. It also states that for the purposes of fees approval, the Permanent Secretary shall require every registered school to submit a plan highlighting how the school shall advance the rights of pupils with disabilities. The Education Act will also ensure non-exclusion of pupils from school for non-payment of school fees or on the basis of pregnancy.